After a major bash at the end of October I’d intended to stay at home for the rest of the year, but events conspired, as they so often do. A short notice closure had come up, and as it happened the Stuttgart area was new to me anyway, so I crossed my fingers that it wasn’t going to be a ‘sudden death’ bustitution and off I went. I didn’t get the branch this time, but had a solid bashing weekend nonetheless. Unexpected visit to Stuttgart occasioned by the closure of the Vaihingen Nord to Enzvaihingen branch, supposedly from 30.12.01. After booking, I discovered it had already closed! [Or had it. But as so often, that’s another story.] For even better value, the final post-closure railtour runs about 30 minutes before the earliest I can get there. Can’t win them all. Off to BHX at a very unseemly hour for the 0610 KLM-UK to Amsterdam. Found the check-in open at 0455 with the (I suppose) inevitable excitable group of ‘lads’ off for a weekend in Amsterdam. ‘You won’t want to sit by them’ said the understanding check-in lady. How right she was. All done and dusted by 0510 including a visit to Salisburys. Loaded in by 0610, we were informed that due to bad weather at Schiphol, air traffic control wouldn’t let us go for 45 minutes. 6 minutes later, we were pushed back. On time arrival at AMS in weather so vile the first thing we saw of the ground was the airport boundary. Then the fun started. Long trog to B2 where the 1000 Stuttgart flight was to be. Lots of ‘platform alterations’ including ‘0900 Stuttgart, immediate boarding at C13’. Made another long trog back to C where the 0900 had been taken off the display. Decided to wait and see and was eventually rewarded at 0915 by ‘0900 Stuttgart, immediate boarding at C13’. Made haste to C13 and asked the airline lady if there was any chance of a transfer. Had I any baggage? No. ‘My colleagues will be very pleased then, they’re overbooked’. So the 0900 it was, (a Fokker 70) to be told ’20 more passengers are trying to find us, we’ll have to wait a few minutes’. [Remember at this point I still had hopes for the railtour, being still 45 minutes early…] Some time later ‘the 20 passengers haven’t shown up but we have their baggage so it will have to be unloaded. This took an age, and we were eventually airborne at 1030. I consoled myself with 1152 to Filderstadt and back (very boring, all underground) then continued on routine S-Bahn alignment. The flying junction near Vaihingen affects the main line, unfortunately. Further consolation by using the extra half hour to visit the Stuttgarter Lokalbrauerei at Calwerstr. 31. Excellent Christmas beer to be had, loads of ogs and very tasty (5.8% in fact). 1313 to Backnang was a very routine urban trudge over previously done track (apart from S-Stadtmitte to S-Hbf (tief) which is underground anyway). Backnang is a bleak concretey sort of station with a good phot spot on the footbridge - I hope. 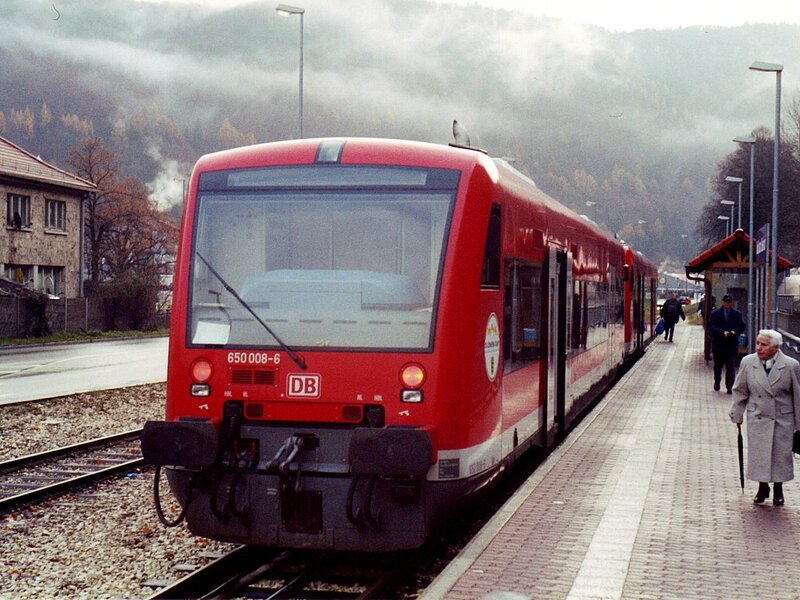 A 110 took 2 coaches to Marbach where unfortunately it terminated in the north side bay. Did my best for principle by using the rear car of the S-Bahn to Feuerbach, thus at least getting a geographical overlap. Decent looking pub at Marbach, but only 6 minutes to get across the station to the S-Bahn unfortunately. More urban trundling to S-Feuerbach (having noticed belatedly that Zuffenhausen is in the V of the junction with the Weil der Stadt line). It proved a better bet anyway because there was a reasonably thriving station bar with Schwäben Bräu Meister Pils far from undrinkable. Onwards (just - cut it a bit fine!) to Korntal where the WEG trains to Weissach leave from a bay. To do the connection (from the bay at Feuerbach incidentally) requires going one station beyond Korntal. Korntal was dismal and rainy so obviously the Korntaler Hof, a four-ale bar across the road, was a better bet. Stuttgarter Hofbräu provided a very reasonable pils referred to by the barman as ‘export’. The Weissach branch turned out to be very dull in the lower reaches but much better further up. The trip (in a single railcar of the Regentalbahn or ‘proper’ variety) was enlivened by being 20 minutes late due to a steam hauled (tank loco, didn’t see what due to surprise!) Nikolasfahrt which was crossed at the station before Heimerdingen [Hemmingen] . 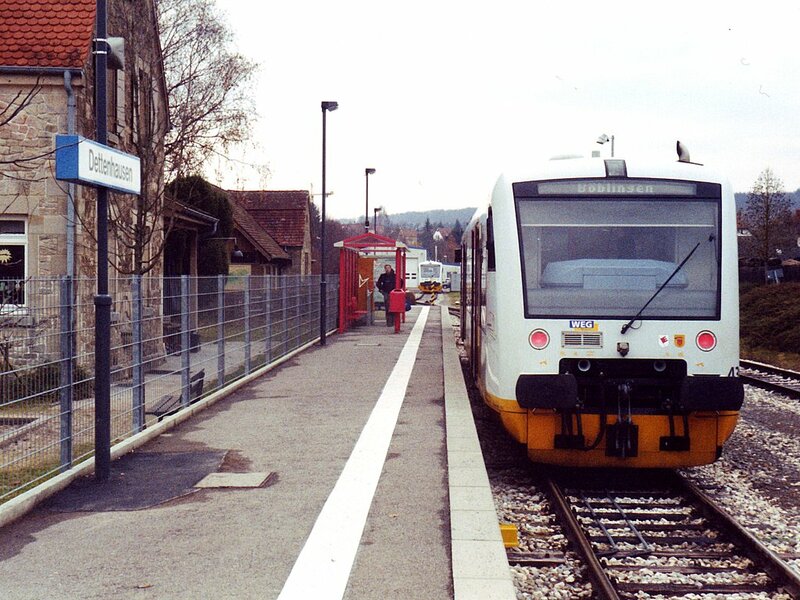 Weissach is a ‘proper’ terminus with a stop block below the level of the surrounding ground – clearly it was always the end of the line. A phot was taken – 1/30 at F1.8 using 400 ASA film! [Not being much interested in karts, it’s taken me 5 years to identify these Regentalbahn and WEG units. They’re type NE 81, built by Waggon-Union of Berlin ]. The bus stop was located with the aid of a friendly local garage, and the 1647 (hence the poor light - train arrived at about 1635) bus was taken to Leonberg on the Weil der Stadt branch by which time it was dark and raining. I returned to Stuttgart Stadtmitte with the intention of dining at the Lokalbrauerei but exhaustion had set in so I continued to Plochingen where the Christmas market was in full swing despite the rain. Not surprisingly the Hotel Schurwald at Marktstrasse 13 was right in the middle of it. Slightly refreshed by a catnap on the S-Bahn I set off for a meal but found only 2 Greek, 2 Italian and one very expensive German establishment. The Bahnhofsgaststätte looked very uninviting so I decided to risk Wenlingen. Despite late running trains, rain and very unpromising surroundings this proved a good bet; after a short soaking I located the Gasthof Bären which obliged with a pfefferschnitzel, in reality a pork steak in gravy with a few peppercorns, and the very pleasant Stuttgarter Hofbräu Export again. 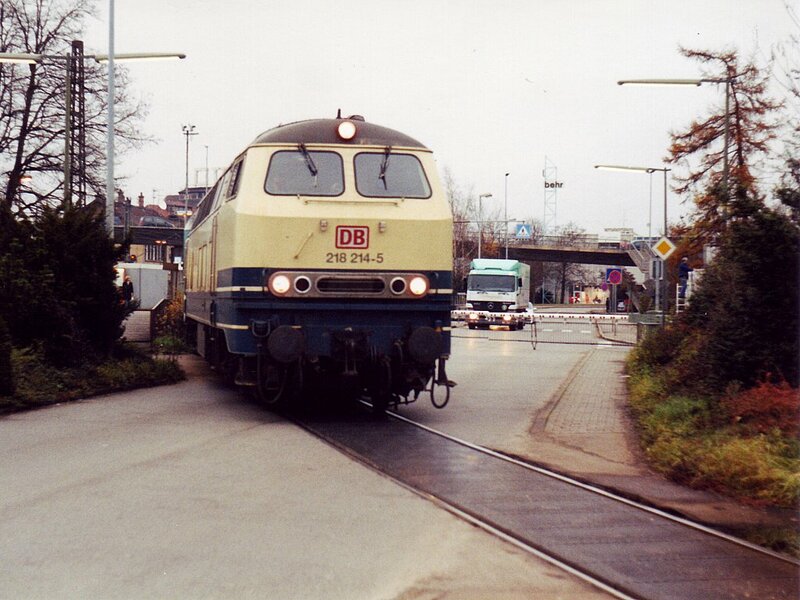 Back to the station in some haste for the 2053 to Kirchheim and back from there on the 2120 to Plochingen thus doing the physical connection at Wendlingen, very necessary as the Lenningen branch curves off across the road half way along the station. Much refreshed by 9 hours ‘never moved’ sleep, a shower and a good breakfast complete with ruhrei, set off for 0844 to Metzingen. Luckily I had just enough cash for a Schönes Wochenendticket, since the booking office was shut until 1040. Off to Metzingen where all Bad Urach trains leave from P3. This is a loop, but without booked services other than through Bad-Urach-Tübingen ones, which reverse, so honour is only partly satisified. Bad Urach is a very nice little branch on the edges of the Black Forest. It runs up the Erms valley. With a 3 minute turnround there was time only for a quick phot before returning to Metzingen, noting the connection with some irritation… Better news at Tübingen where shuttle trains to Herrenberg leave from a bay but through ones from Plochingen to Herrenberg (of which the 1047 is one, fortunately) use a main line platform and do the connection which is just west of the station. On to Herrenberg on another low floor Adtranz kart (exceptionally unexceptional trains so far this weekend, hence little comment. Adtranz karts also to Kirchheim, Bad Urach. Stuttgart S-Bahns notable only for being non-corridor and toiletless which considering the length of some journeys is a bit risky!) Herrenberg had to be declared a draw; it has a double track bay on the east side. 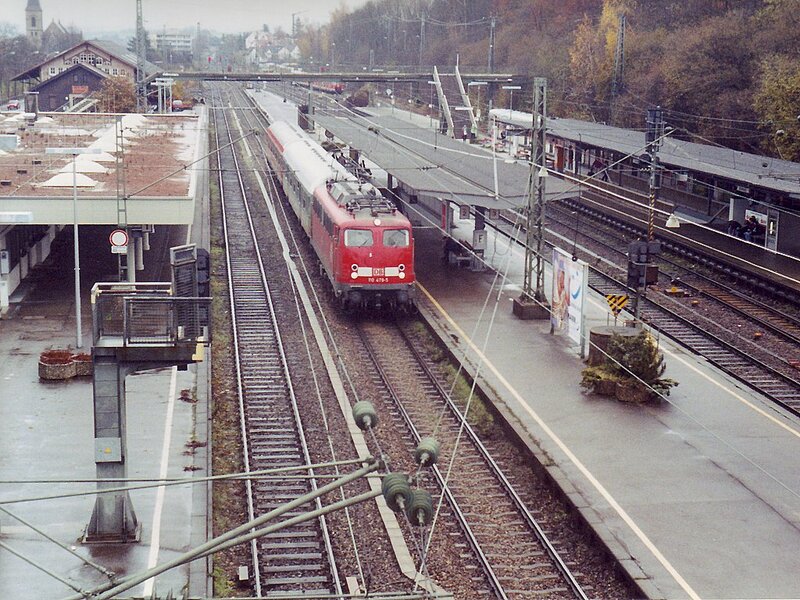 The easternmost of the two (platform 102) is used by Tübingen trains and has a rusty crossover to the main line suggesting that no trains from the south use it. The other bay platform (P101) is used by the 2 hourly shuttles to Horb, so my 1147 to Horb, a 628 which went from P101 is about the best I could hope for. During the half hour break I went to the pub across the road – very amiable landlord who suggested the highly palatable Rothaus Pannen Zäpfle (this might be hopelessly wrong, but sticks in the mind), a 5.1% bottled beer from the Black Forest. He was also good enough to demonstrate the TV card on his PC which had a TFT monitor. Good enough for watching TV but not for editing video, I think. As luck would have it a car ad was on, and the screen was struggling with the quick bits. The landlord was a big games player and said it was too slow for that. Arrival at Horb was on the northernmost P1 but the Pforzheim train comes from Tübingen and reverses in P5 so hopefully no problems - a diamond crossing at worst! Horb looked quite seriously shut but a cheery bahnhofsgaststätte dispensed Alpirsbacher Klosterbräu Weissbier (catchy) which is another very palatable Black Forest beer. It remained only to dive down the S-Bahn and get the 1548 to Weil der Stadt for the unfinished business beyond Korntal. 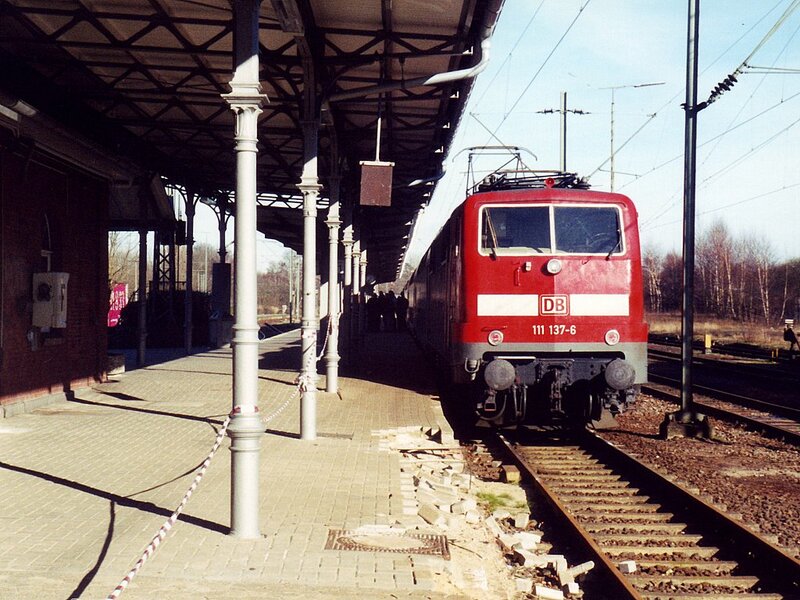 It has to be said this is another unexceptional line but it made constructive use of the remaining daylight with the 1622 arrival at Weil der Stadt allowing another dodgy photograph (see Weissach, 1.12.01). Back from Weil der Stadt on the same train (impressively uncomfortable) to Stadtmitte where I decamped for an early supper at the Lokalbrauerei. All you can eat between 1000 and 2400 for DM15.15 which is very reasonable value even for a normal meal with a pud which was what I had, along with another sample of the Weinnachtbier. Back at Plochingen, by S-Bahn again, the Christmas market was nearing its end but the Red Cross gluhwein stall still managed to wring one more mugful out of the urn for me. Very enjoyable it was too. Early doors today for 0640 to Wendlingen. Hotel breakfast was in full swing at 0600 so no problems. The RE was slightly late but the connection was waiting at Wendlingen – to my surprise hauled by blue and cream Rabbit 218214 with a push pull set, quite full too. At Kirchheim we passed another Rabbit, red 218160, on 0636 Oberlenningen-Wendlingen. 0651 Oberlenningen-Plochingen had another red one, number not visible. Technical daylight was well in evidence on arrival at Oberlenningen (where there is a large cement (?) factory) so the decision to push the boundaries and give myself an extra hour proved to be a sound one. It must be said this isn’t the most interesting of branches. Semi-rural, semi-suburban, semi-interesting! Faced with over half an hour at Wendlingen, also not wildly interesting, I chose to go back to Plochingen on an Adtranz kart which had arrived on a short working. There was indeed more to see at Plochingen in the 17 minutes or so before the 0844 RE to Tübingen arrived a couple of minutes late. This was still a couple of minutes late at Nürtingen but the WEG (Württembergische Eisenbahn Gesellschaft mbH) kart for the Neuffen branch was held and left at 0901 (vs 0859). This is a very smart branch with the units in an attractive blue, yellow and white livery and all the stations in good condition with new platforms. The shed at Neuffen has been extended and is occupied by the WEG karts and also the local kettle, a small multidomed tank loco run by GES. Amazing that this very slick and smart operation belongs to Connex! Back at Nürtingen the RE turned up on time-ish but then suffered several signal checks and was 5 minutes late from Plochingen. With a 6 minute connection 1033-1039 at Bad Cannstadt this was a bit of a worry. 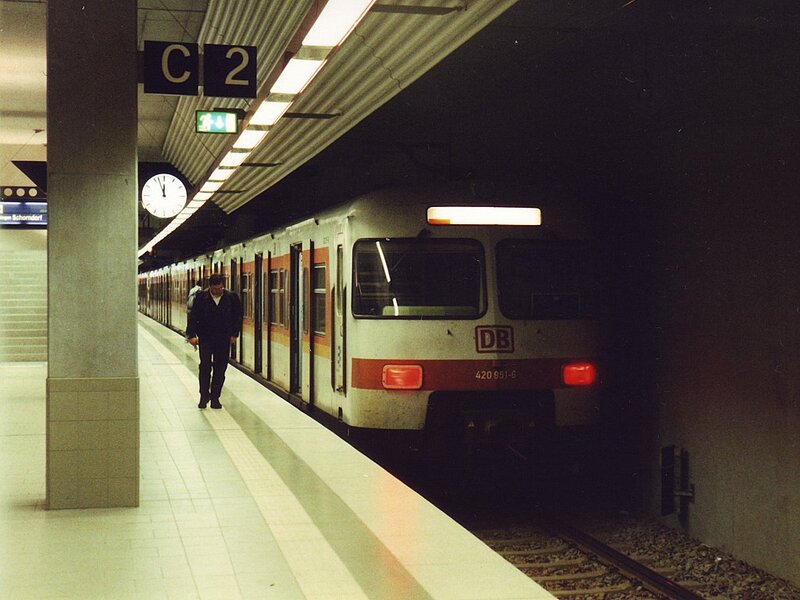 Arriving at BC I saw an S-Bahn departing in the Schorndorf direction as I dived into the subway but at the bottom of the steps I realised it was ‘only’ 1038 and as I emerged on P3 the Schorndorf train arrived. Very dull stuff to Schorndorf, where another WEG Adtranz kart was waiting. More semi-rural, semi-outer suburbia to Rudesberg Nord – semi-industrial, semi-outer suburban and wholly ill-kempt. Most disconcerting when the kart disappeared but it (or its twin) reappeared just before 1152 with a larger unit attached. Very shortly afterwards scores of schoolchildren appeared which explained it all. Despite all this we were on time at Schorndorf. 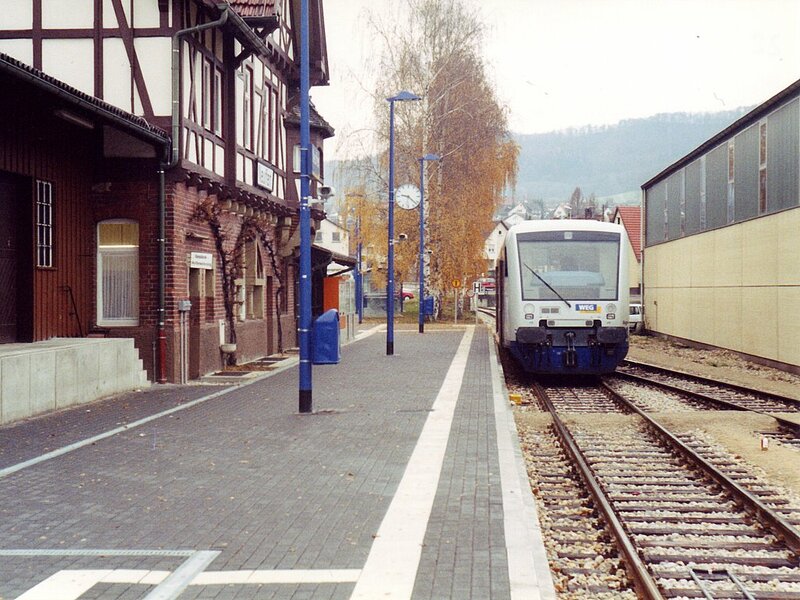 The shuttle to Schwäbisch Gmund was noted with one coach. To be kept an eye on, perhaps. 1215 RE to Stuttgart Hbf was made with ease and made a welcome change from the S-Bahn. With a punctual 1238 there was time enough to have a look outside (quotation from Hegel on the station façade) and grab food and drink before departing for more very dull stuff on the 1305 S-Bahn to Böblingen. Scores of children again for the WEG Adtranz kart (is this getting familiar, or what?) to Dettenhausen. This is another pleasant little branch with the karts maintained in a small purpose built depot just beyond the station. Admittedly this is outer suburbia but these branches do seem to lack some of the character of their ex-DR equivalents. Written too soon. On return to Böblingen it was noted that P1 is entirely devoted to Dettenhausen services (though it may well be a loop). The Sindelfingen (accent on the Sin not the delf) trains have to do the physical connection, so no problem with that. Sindelfingen itself is a run down three platform station alongside (I assume, as the sidings were full of car transporters) a car factory. Presumably the rush hour only service is mainly for the benefit of that. In retrospect, I could probably have made Herrenberg and back (fretting all the way) but it seemed only fair to the Rough Guide to try out Zum Paulaner in Calwerstrasse, so I did! Very nice too, far more subdued and with an older clientele than the Lokalbrauerei shed, but still a nice place to while away half an hour. Paulaner Weissbier of course. That finished the trip in effect; it remainded only to go back to the airport, punctually back to Schiphol on an AR72 (is this the noisiest passenger aircraft in existence?) and thence on a packed Fokker 100 to Birmingham. Sufficiently packed that they were being extremely fussy about cabin baggage but I didn’t have any problem. That trip really did finish 2001. I waited out the rest of December and January before setting off to north west Germany in towards the end of February.